Art Club - Students in grades 1-8 meet once a week after school in the Art Room to work on creative projects. Schedule will vary between the lower and upper grades. Creative Writing Club - All middle school students in who love to express themselves through original writing are encouraged to join the Creative Writing Club. We will make use of Chromebooks during our meetings. Students will have the opportunity to learn about different types of writing and will share what they've written with the group. Cross Country Club - Students in grades 3-8 train on Mondays in the Fall to run one to two mile races. We participate in races at public and private schools in Baltimore County. The race days will vary during the week. Lego Club - Our Lego club is for students in grades 1-5. They meet one day a week for engaging lessons that will give students an understanding of science and math concepts while building with Lego bricks. Magic Club - Our talented magicians in grades 6-8 meet twice a month during recess to share different magic tricks and ideas with members of the club. They also perform and share these dazzling tricks at the end of the year for younger students. Robotics Club - Students in grades 5-8 meet to explore programming and building robotic systems on Thursdays after school. We Got You Covered Club - This club was formed to help our school families who may need a little extra love (family member undergoing medical treatment, sudden death in the family, etc.). This group of students will get together to make a no-sew fleece blankets and will probably meet once a month, after school, for an hour. World Language Club - this club is for 8th graders interested in learning about different cultures and languages! If you want to learn about French, Italian, Greek, etc. this is the club for you! This club is to enhance students knowledge about cultures and languages other than English. They will learn about cultures through films, food, books, music, and so much more! Academic Competitions - Middle School students may participate in a variety of academic competitions hosted by area high schools. Teams meet after school with a moderator to prepare as needed. Altar Servers - Sixth through eighth grade students have the opportunity to be trained to assist the priest on the altar during Mass or other liturgical celebrations. These students participate in parish and school liturgies. Commitment is an important part of this activity. Art & Writing Contests - Community organizations sponsoring these contests contact teachers and they in turn make the opportunity available to students. Saint Joseph Students have received awards in both Art and Writing Competitions. Child Safe - This is a program offered to grades kindergarten, five, and eight. Catholic Charities Children Continuum sponsors it. This program is designed to provide personal safety skills and help children know how to tell supportive adults if situations occur. Our school counselor facilitate this program. Finding Kind Committee - This program was formed by a group of middle school girls and the school counselor, after attending a powerful presentation by the founders of the program at Seton Keough High School. The committee meets weekly and at times twice monthly throughout the school year and provides presentations for girls in grades 3-6, in an effort to reinforce the message of kindness, compassion and understanding among girls. First Lego League Team - St. Joseph School has two First Lego League (FLL) teams (8 -10 members per team). Each team researches a real-world problem based on a theme and develops a solution to the problem. Teams also design, build, and program a robot using LEGO MINDSTORMS®. Members of this team participate in a local FLL tournament. Instrumental Music - This program is open to students in grades four through eight. It is offered as an extra-curricular activity. All band students take lessons once a week during the school day and have recess or after school practices depending on their group. Parents who want their child to participate in this program sign a contract directly with the Instrumental Music Program of Columbia, MD who sets all fees. Our band has been ranked #1 many times over! Living Rosary - We honor Mary in the month of May. The Living Rosary is one way students actively show devotion to The Blessed Mother. This devotional celebration involves students from all grades. It concludes with traditional May hymns and the Crowning of Mary. Music Ministry - Students volunteer to become part of this Music Ministry program. Students taking advantage of this activity have opportunities to cantor, become part of the choir, and contribute to the liturgy. National Junior Honor Society - Membership in NJHS is based on national guidelines and local standards. Students in grades six through eight are invited to become members each year based on exemplary academic achievement (an A average in each major subject) followed by demonstrated leadership, service to the school and parish, and good character. Peer Mediation Club - Our Peer Mediation Program is an approach to help students work cooperatively to resolve their conflicts when they have been unable to solve them on their own. Student mediators are taught skills used to guide disputants through specific steps to reach an agreement. The training involves twice weekly lunch meetings for a period of approximately four months. All mediators are supervised by the school counselor. Mediators help foster a positive environment at school and serve as role models/leaders for younger students. Reading Buddies - This is a program designed to provide a chance for our older students to mentor their younger schoolmates. Each grade is assigned a "Buddy Class". Students meet to share experiences such as reading, writing, or special day activities. Recess Ref Program - Eighth grade Recess Refs work in pairs to assist 3rd, 4th and 5th grade teachers weekly to insure that organized games are played fairly. The school counselor coordinates the program for the students.The Refs are role models, exemplifying the qualities of good sportsmanship, responsibility and leadership for the younger students at recess time. Red Ribbon Parade - This annual event is held in October to promote a drug-free lifestyle. Students in any grade may participate. 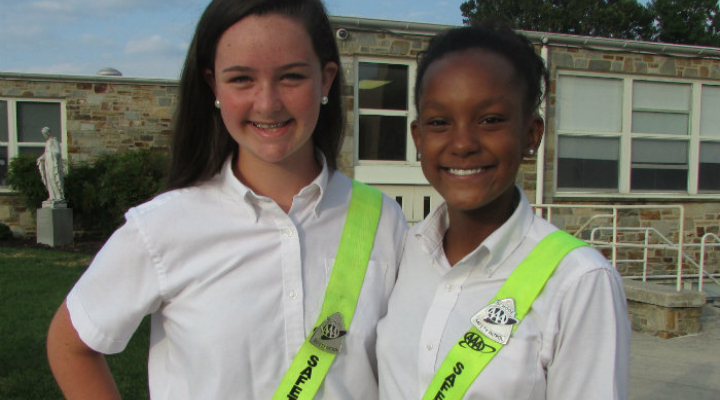 Safety Patrol - Middle School Students are able to volunteer for this activity. It is a service to their school. They assist at morning arrival and afternoon dismissal in order to assure procedures are followed and all are safe. School & Archdiocesan Spelling Bees - St. Joseph School holds an annual Spelling Bee each spring for its students. Champions are named in the primary, intermediate, and middle school grades. A School Winner is also determined. Top spellers are asked to represent our school in the Archdiocesan Spelling Bee. School Masses - School Masses are planned by a committee of teachers and are child oriented. Students also attend regular 8:15 a.m. Parish Mass every Wednesday throughout the school year. Stations of the Cross - Students in grades 3-8 participate in the Stations of the Cross in church on Fridays during Lent. K-2 experience the Stations through video or other teacher initiated activities. Student Activities Committee - Students work with a teacher moderator to plan a variety of events and activities to involve students sharing with others. The committee offer students in grades 6-8 an opportunity to grow in leadership and responsibility. Student Ushers - This is a volunteer group of 8th grade students, willing to give service to their school community through ushering at school liturgies and graduation. Talent Show / Middle School Play - Held in alternating years, these performance opportunities allow students to showcase their talents, whether on stage or behind the scenes. Track & Field - Students in grades 4-8 tryout to participate in Track & Field competitions. Training varies during the week.